San Jose, CA - Santana Row ends the year on a high note with holiday celebrations that include a Holiday Open House, a benefit for Second Harvest Food Bank; and Santa Paws, a benefit for Humane Society Silicon Valley. Then get ready to count down to 2016 at your favorite Santana Row restaurants and posh Hotel Valencia. Be sure to keep early February open to join football fans for Super Bowl 50 festivities at The Row! Discover the latest in beauty products and gifts at Sephora’s Santana Row location! Explore its unrivaled selection of makeup, skin care, fragrance and more from classic and emerging brands. The 5,339 square-foot store is located on Santana Row Boulevard, next to Sino restaurant. “Dear Santa…” Write a letter to Santa and get a letter back! Write a letter to Santa and receive a reply! Beginning Nov. 17, every child who leaves a letter for Santa in the mailbox outside of the Santana Row concierge office will receive a reply from the red-clad, jolly fellow! Each letter must include the child’s name and a mailing address. The letters must be dropped in the box by Dec. 10. Concierge is located near the garage between Sino restaurant and Left Bank Brasserie. Avoid the headache of game day traffic! Take the shuttle from The Row to Levi’s Stadium for a hassle-free day that starts with easy parking, shopping and dining perks. Shuttles leave exactly two hours before game time. The shuttle registration begins about 30 minutes before departure time. Registration and shuttles are located near the CineArts Theatre. When you arrive at Santana Row, park your vehicle in the designated, secured parking lot on Winchester Boulevard in the former Century 21 Theatre area. Walk across Winchester Boulevard to Olsen Drive where the registration table and bus will be waiting to load in front of the theater. The bus departs at the scheduled time (two hours prior to game time), and will not wait for passengers. The bus will park at the official shuttle drop-off location at the stadium. One hour after the conclusion of the game, the bus will depart from the same location. All passengers not on bus at the specified departure time, will not receive transportation back to Santana Row. Sunday, Dec. 6, 11 a.m. to 2 p.m. Your furry friends are ready for their holiday close up! Bring your canine and feline friends to Santana Row's Park Valencia for a keepsake photo with Santa Claus. Photos are $20 with a portion of the proceeds going to the Humane Society Silicon Valley. Registration begins at 10:30 a.m. in Park Valencia. The last Mommy & Me of the year will be held in the lobby of the CineArts Theatre and will include live entertainment from Andy Z, story time with Mrs. Claus, treats, crafts and more holiday fun! Details: 10 a.m. to noon in the lobby of CineArts Theatre. Mommy & Me & Daddies, Too is a free kids’ club held on the second Tuesday of every month from May through December. For more information, call 408.551.4611 or visit SantanaRow.com. Tuesday, Dec. 8, 6 p.m. to 9 p.m.
Give to those in need while you complete your holiday shopping during Santana Row’s Holiday Open House, a benefit for Second Harvest Food Bank, which provides groceries and food to families and individuals in Santa Clara and San Mateo counties. Santana Row celebrates the Jewish Festival of Lights in Park Valencia with family activities that include decorating dreidels, Jewish story time, arts and crafts and the lighting of the Menorah. *In the event of rain, this event will be held inside the via between Left Bank and Sino restaurants. Santana Row partners with 100 OCT to present Cars & Croissants on The Row, a monthly gathering for exotic car owners and car enthusiasts. On the fourth Saturday of the month from March through December, exotic car owners are invited to park on Santana Row Boulevard from Alyssum Lane to Tatum Boulevard, display their cars and mingle with other enthusiasts. The morning meet-up for coffee, croissants and cars drew 400 people and 60 cars during the first event and continues to grow in popularity. This event is free and open to the public. Two restaurants are open for lunch and dinner on the last day of 2015 with special menus and festivities for diners who stay until midnight. Prix fixe menu items will also be offered on an a la carte basis and the regular lunch menu will be served. There is no Happy Hour that day and all prices exclude beverages, tax and gratuity. The restaurant will be festively-decorated in the spirit of the occasion and guests for the evening's last seating will receive a complimentary sparkling wine toast and party favors at midnight. For more information or reservations please call, 408.244.1180. Ring in the New Year in white and gold at the hottest spot on Santana Row. Hotel Valencia’s New Year's Eve celebration is always the toast of the town! Bid farewell to 2015 and welcome 2016 by taking advantage of the holiday package. *Guests are encouraged to bring their own festive masks as limited quantities will be available on a first-come, first-served basis. Rates from $585 per room, per night, double occupancy, exclusive of tax; additional guests are $125 per person and subject to maximum occupancy. Celebrate Super Bowl 50 at Santana Row! will be hosting Super Bowl events and offering shuttle service to hotel guests from select hotels and to Levi’s Stadium on game day. More details coming soon! Live music in the parks and plazas from Thursday, Feb. 4, 2016 through Sunday, Feb. 7, 2016. Round-trip shuttle service from the Hyatt, Hilton and Marriott hotels in Santa Clara to Santana Row. The free shuttles will be offered Friday and Saturday (Feb. 5 and 6, 2016) from 11 a.m. to 9 p.m.
Super Bowl ticket holders can conveniently pick up their tickets in the days leading up to the Big Game. Ticketmaster will be on site at Santana Row, next to Z Gallerie. On Super Bowl Sunday, Santana Row will have its ongoing shuttle service to Levi’s Stadium for those going to the game. Shuttles depart two hours before game time! Here’s hoping the rainy season returns! Santana Row is optimistic and wants to reward shoppers and diners braving bad weather. When there’s a 70 percent or greater chance for rain, they will be offered discounts that include 15 percent off purchases at participating shops and restaurants, a free signature Santana Row golf umbrella for customers who spend $150 anywhere on The Row and a $20 gift certificate to a participating shop or restaurant for customers who spend $300 on a designated Rainy Day. Federal Realty is a recognized leader in the ownership, operation and redevelopment of high-quality retail based properties located primarily in major coastal markets from Washington, D.C. to Boston as well as San Francisco and Los Angeles. Founded in 1962, our mission is to deliver long term, sustainable growth through investing in densely populated, affluent communities where retail demand exceeds supply. 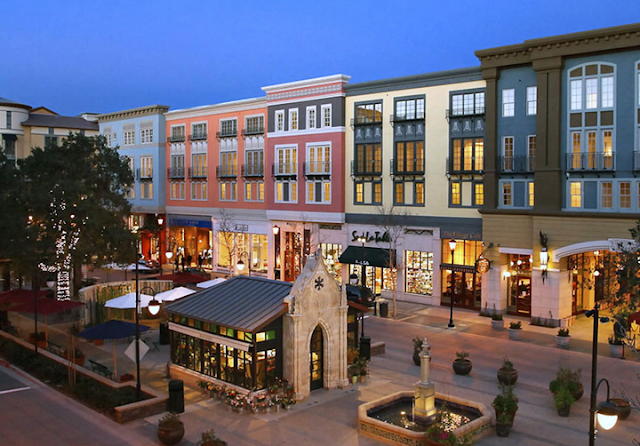 Our expertise includes creating urban, mixed-use neighborhoods like Santana Row in San Jose, California, Pike & Rose in North Bethesda, Maryland and Assembly Row in Somerville, Massachusetts. These unique and vibrant environments that combine shopping, dining, living and working provide a destination experience valued by their respective communities. Federal Realty’s 90 properties include over 2,600 tenants, in approximately 21 million square feet, and 1500 residential units.